The above photo was taken at a lunch party held on Sunday 7 August 2005 in honour of Simone and Ivan Ruben who had popped over from France for a few days. 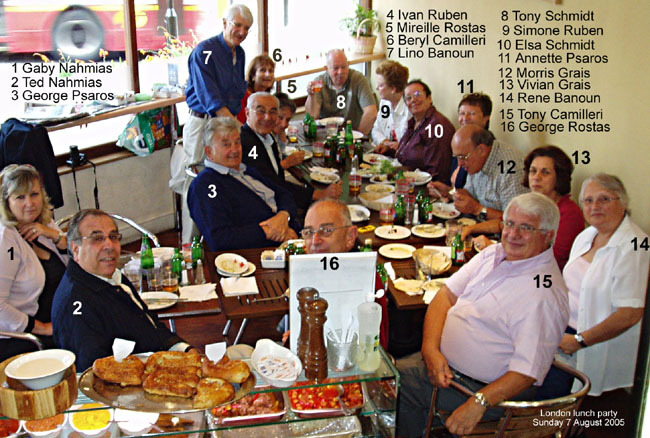 The lunch was organised at David's Deli by Lino Banoun with his usual flair and sang-froid in the face of the customary bad behaviour and terrible noise which this shella are capable of generating even when they are happy and satisfied. The food was basic Egyptian + koubeba, tabbouleh, tsatziki, etc, and the table manners of the males present would have shocked any badly brought-up Saidi kid. After batiha+gibna (haloumi) and assorted mazbouts and ziadas as well as naana shaii we staggered off to the Banouns appartment 60 metres away to recover from all our exertions.